It's not Boracay, but it does have sand,ocean, and some good swimming. Being both on the coast and in the tropics, visitors and newcomers might have big hopes for Tainan to have lovely white sand beaches complete with swaying palms and turquoise blue water. Well, it doesn’t. But there are a few beaches in the vicinity of Tainan that are pretty decent. The closest to the city is on the coast side of Anping, thus most people refer to this as ‘Anping Beach.’ It is actually called Chiao Tou Beach Park, or Bridge-end Beach Park, on the sign. This beach is a lovely place to catch a sunset. In the daytime it is a great place to enjoy Tainan’s seemingly ever-present sun. During the warmer months, though, it can be quite hazy and the sun can be oppressively glaring. Shade is minimal, so you may want to consider bringing your own. Additionally, the beach can be pretty dirty. This is especially true during typhoon season, and there’s often a swimming ban during this time as well. The beach is seldom crowded and you may be surprised to find you are there with only a handful of other people, even on the weekend. You do see a few families enjoying the beach and it is a popular place for particular youths who enjoy the sun and surf. For good people-watching, check out the young local ladies whose beach attire includes boots, leggings, long-sleeved shirts, gloves, hats, visors and scarves, all the while carrying parasols or reflective car windshield visors. Low be the woman who lets an ounce of sunlight spoil her precious white skin. Skimboarding seems the most popular sport at this beach. Windsurfing is also popular. 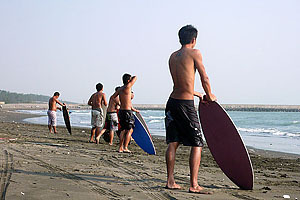 Surfers and kite surfers tend to head to Golden Beach to the south of Tainan. Through the line of trees that separate the beach from the highway is a boardwalk that is part of the bike path joining the coast with the Lakeside Water Bird Park towards Sichao Bridge. The swimming at Anping Beach is pretty good, with nice smooth sand running out into the water. Farther to the south past a couple of piers is a more secluded area of Anping Beach that is popular with foreigners and very good for swimming. Getting to the beach is pretty much a straight shoot west from downtown. Head west on Minsheng Road. Minsheng will become Anping Road after Zhonghua West Road. Right before Anping Road narrows, there’s a bit of a fork. This is where you’ll make your only turn, heading right onto Anbei Road. Keep following this road (the name changes to Anping 1st Road, but you probably won’t know it) until you reach the end at the west coast highway. The beach is just to your left behind a wall of trees. Look for some roadside vendors to mark the spot. Biking is a nice way to get out there. You can also drive, but a taxi would be a little pricey. To get there by bus, take the 99 all the way through Anping and get off on the south side of Sichao Bridge. You do an amazing job with those posts. I’m very happy that someone if finally taking the time to show Tainan City to the world in English. We would love to get to know you (iTainan) and work together to bring this message out. Keep on the great job. Thanks for the support. Hope you come back to Tainan sometime. Great, I will be visiting this weekend and looking forward to the beach! 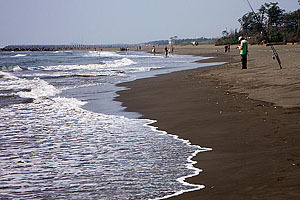 There’s no cost for any of the beaches around Tainan. At some beaches in Taiwan there are umbrella and chair rentals, but I don’t know of any beaches that charge per head.